These words of our interior designer, Vikram (Founder, Sutra Designs) had ascertained the “I ought to meet these amazing artisan women” idea in my head. And the wish soon became reality when we visited Vimla Rugs. Remember we told you about our visit to the factory from where Vikram procured rugs for our new office? 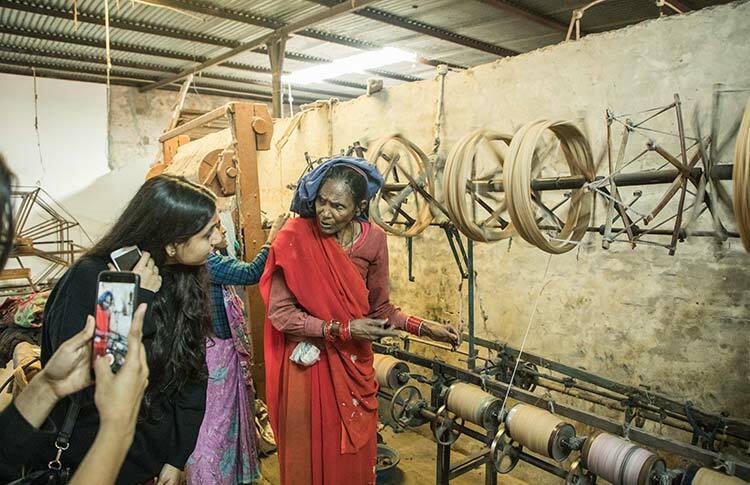 So when the owner, Mr. Dinesh, and his daughter, Harshita, were showing us around the factory, introducing to us the various stages that the yarn has to go through before it is weaved into a beautiful rug, I had been looking to seek an opportunity of interacting with their women artisans. 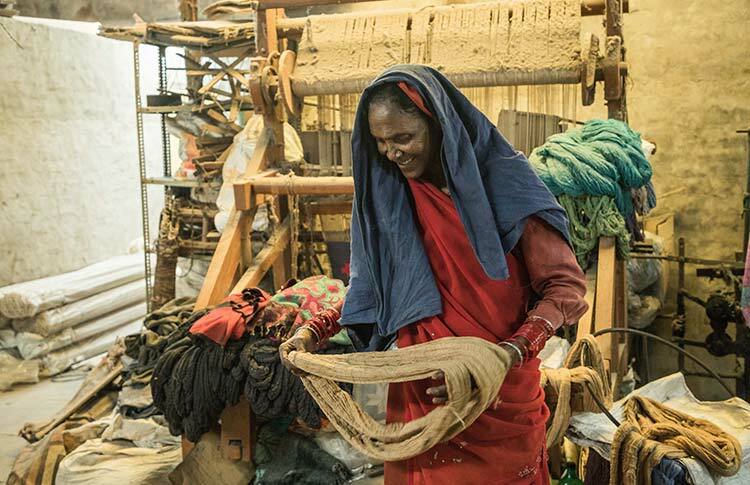 And when we entered this big room where women and a few men were working on loom stands, my eyes lit up. BTW, did you know there are three types of loom stands – Khada, Patta and Khadda? And it is Patta loom that creates the best quality of rug. 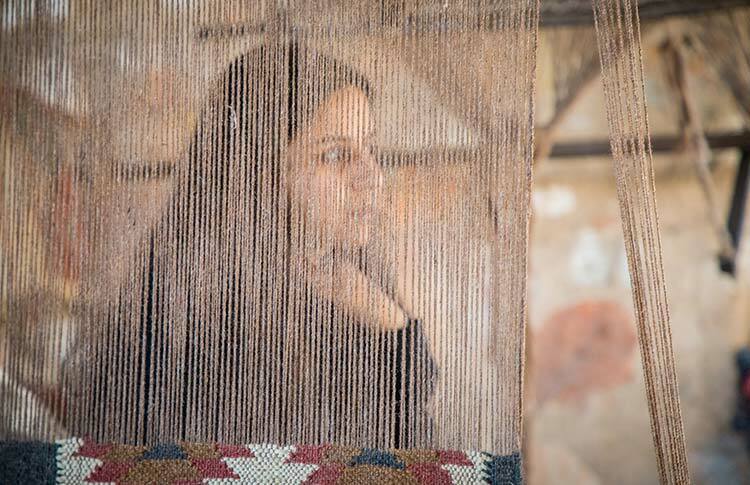 While we talked to few weavers, it was the two women working on some other machine, towards the other end of the room, who caught our attention. They were working on what Harshita told us is called ‘threading’, wherein the washed loom is threaded and converted into a yarn. 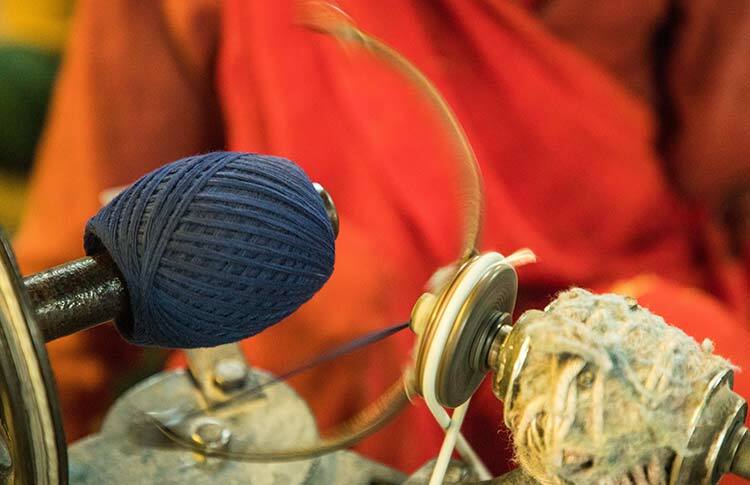 The thread, once dyed and dried, is sent to them and they make them into yarns that can then be put on the loom stands for weaving. And these two women were Kesar Amma and Punni, sitting on the floor surrounded by a large number of colourful reels and yarns. 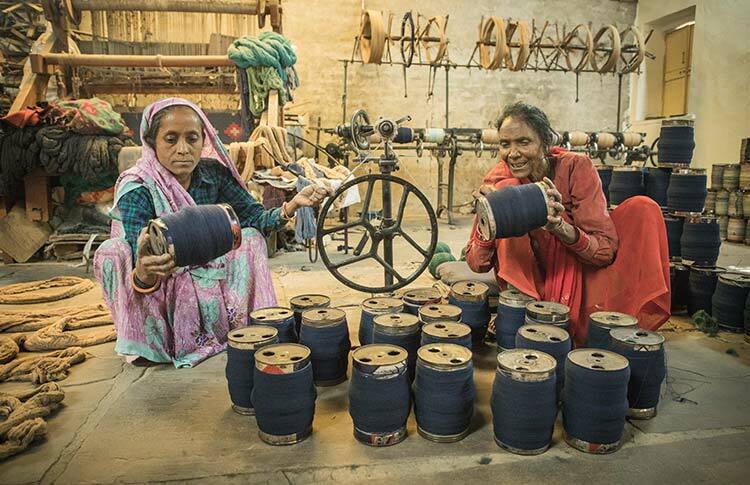 For a while we stayed with them, observing their experienced hands working around the threading rollers, and then they volunteered to show us the second step of their work, converting the thread on the reel into a yarn using the charkha. So sat down Kesar amma and to her aid, Punni, and together they weaved a beautiful yarn for us. After which, we swiftly took Kesar amma out for a quick conversation. “Everybody wants to talk to me only!” she laughed. 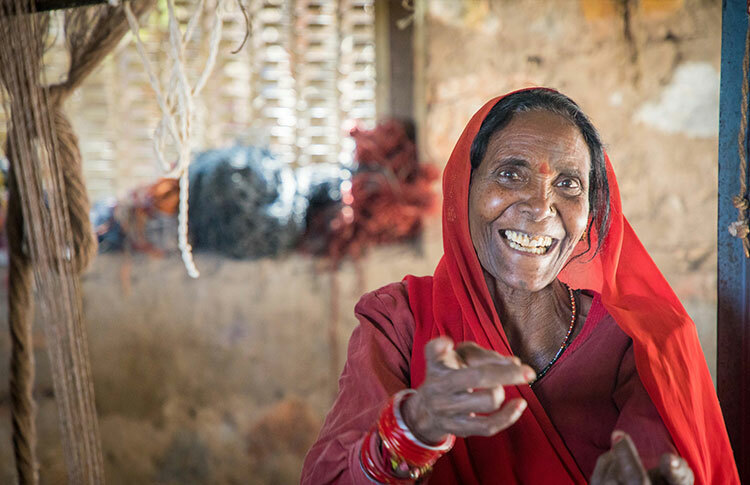 And wearing that smile, she adjusted her saree and directed us to another hall where another group of women were working on ‘khada loom’, and we made ourselves comfortable on the bench of a vacant stand nearby. 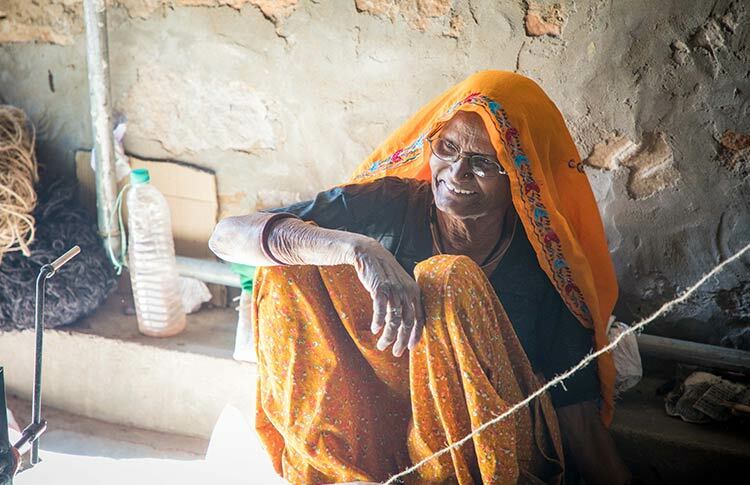 Kesar amma, Harshita told us that you’ve been working with Vimla Rugs for long. Tell us about the beginning? Yes, it’s close to 25 years now. I was the first woman employee here and also the only one for 10-12 years. I had just got my son married when I started working here. Oh, and what did you do before that? 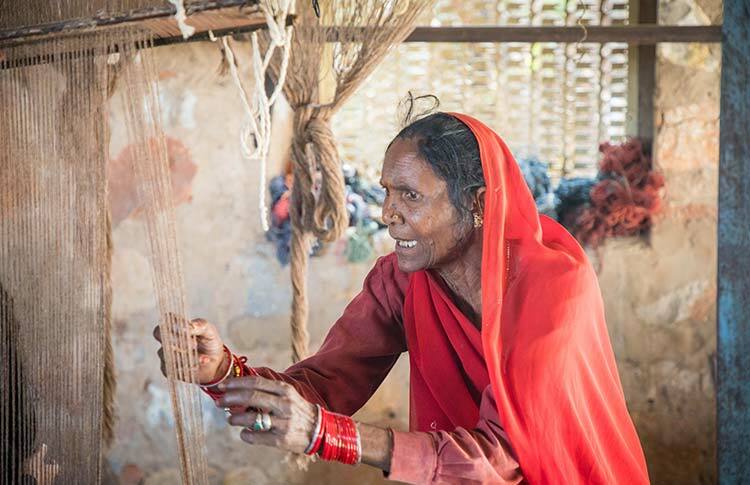 She turned around and pointed towards the grey-haired lady, this work that she is doing, ‘charkha pherna‘ (threading on charkha) it is called. But this is another quality of thread, and even the charkha is small, we used to have a bigger charkha at home and even the thread was of khaadi loom. This is all that I know, never learned any of the other processes that go into rug weaving. Tell us about your family, how many children do you have? I have three children, two daughters, and one son. Son is the eldest, he must be around 40 now, and girls are in the age group of 25-30. As I told you, it was after his marriage that I started working here, and later got my daughters married. I asked if her daughters know this work, too? To which she replied – no, they don’t know all this. 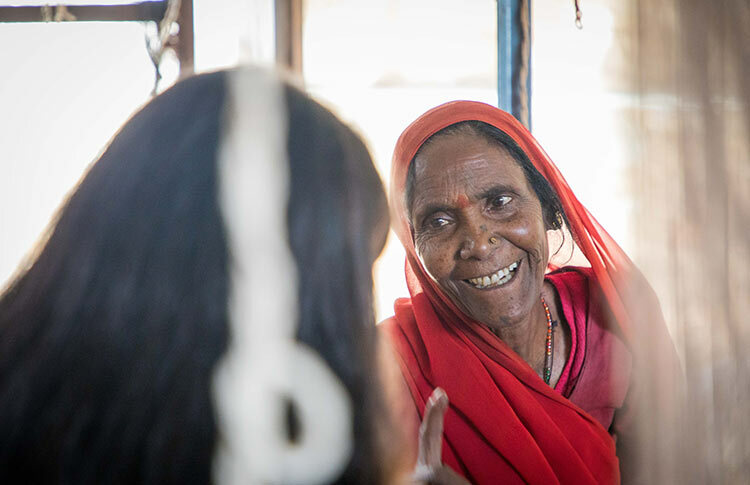 They don’t even live here, one of them is now in Alwar, the mention of which got a smile on her face, but it soon faded when she talked about the other daughter, who she shared lives in a small village nearby. And what about your daughter-in-law? She knows, and the excited tone came back. She had come from a far-off village and knew nothing, but I taught her and she learned so well, she laughed. She has three children and so works from home, but sometimes if I have to go somewhere, then she comes here in my place. That’s nice, and what are your timings here? 9 to 5. But at lunchtime, I go home, and after eating I lie down for a while. My daughter-in-law cooks good food and serves me well on time. Oops so we’re taking your lunch time! Ha-ha, come along with me after your “question-answers” to my place and have food, she said with a smile. Dinesh Ji told us about having created saving accounts for all their employees, is your salary also deposited directly? Yes, I also have an account. But whatever little I earn gets spent in the home expenses. Are Sundays working, I added? Mostly, but sometimes some people come. Oh, he passed away long ago. She again turned to the grey-haired lady behind, who nodded in affirmation. I ran the house by myself, raised and got all my kids married. Earlier also I did the same work, but in a much lesser capacity, and there was no electricity either, so things were tough. To earn extra I worked as a daily wage labour for a long time. May no one ever see the time I have seen in my life, she sighed. Hmmm. But do you feel life has soothed now? Yes, I am fine with where I am today. I have served all my responsibilities, though I wish I could get my daughters educated. My son has studied till class X and now does dyeing work in a factory. But then I tell myself that perhaps I couldn’t have done more. Now there is not much left to do, the day passes by in this work, and all that is needed is two meals of the day, for which I am very thankful to my daughter-in-law. She takes care of me like her own parents. Good people get good people, Kesar amma! Indeed, she replied. Are you two friends, I asked, looking at the grey-haired lady whom she talked to many times in between? Ha-ha, yes. 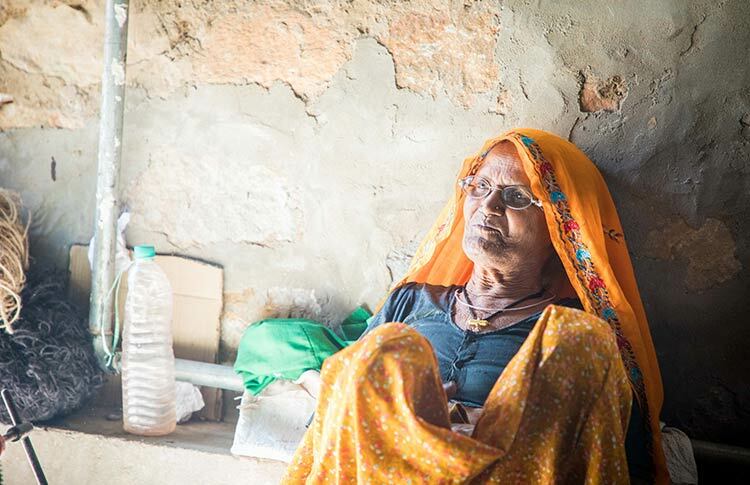 She has been here only for five or six years, Revadi dadi everyone calls her. 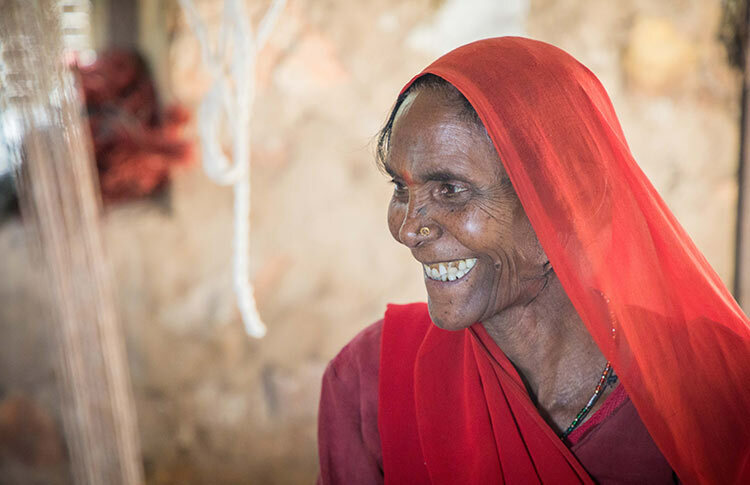 On asking about her age, she said, ask her only, what must be your age, budhiya (old lady), she teased her. She must be 70 plus. And you? Oh, I am only in my 60s, and both the ladies laughed. No, but really, I am not that old, she reaffirmed innocently. And while we were talking to Revadi dadi, Kesar Amma’s co-worker, Punni walked in to ask her if she was coming for lunch, but curios shed joined our conversation instead. 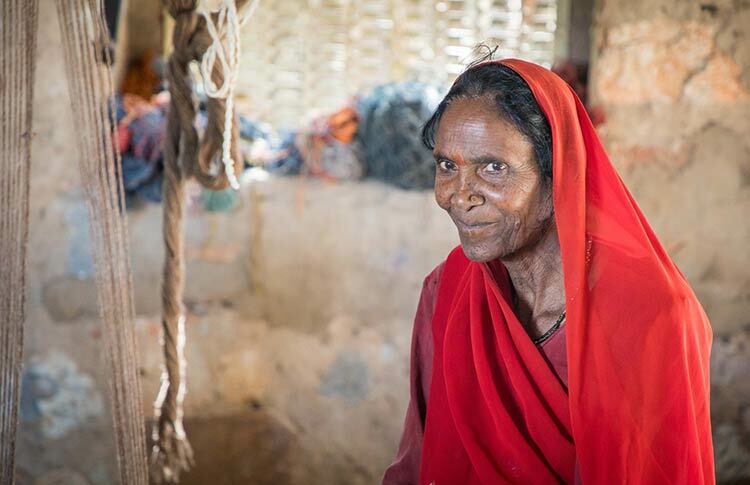 Mother of three children, Punni is also a very old employee of Vimla Rugs. Okay, one last question to you all, tell us the bond this strong women’s team shares? We are glad that we are working together, Punni spoke. Times have changed, earlier women could not get out of their homes, forget work. For good eight to ten years, I was the only woman working here, but now we are a big team, Kesar amma added. We stand for each other in times of need, and we are fortunate that we got the opportunity to work here. Unlike majority of places, it gave us work alongside men, and we’ve never had to think twice about safety or any other issue. 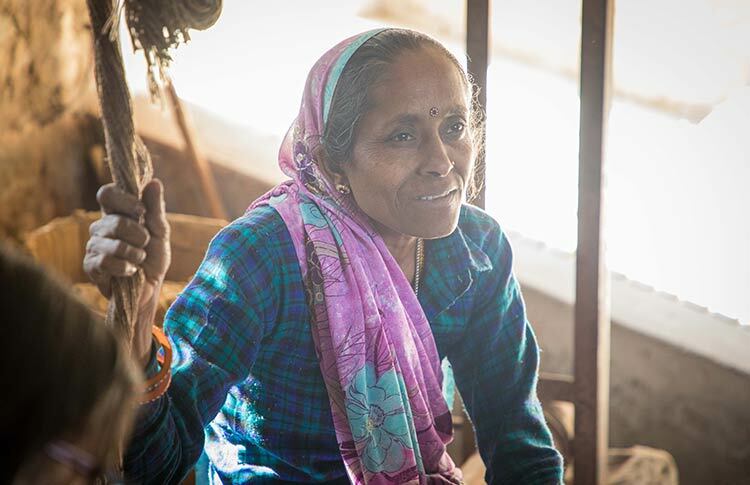 So that’s all from our conversation with Vimla Rugs’ oldest employee, but soon we’ll be sharing another story of one of their new employees, Santara Devi, who shared with us her views on the importance of financial independence for women in villages.